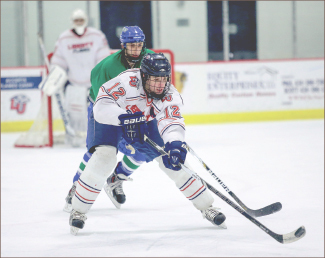 Liberty Men’s Division II (DII) hockey team’s 30-9 season came to end Sunday, March 23 after a 2-1 run in its first American Collegiate Hockey Association Nationals appearance in eight years. The Flames kicked off pool play by defeating top-seeded Grand Valley State University 3-2 in overtime Friday. Sophomore defenseman Nat Arbour, sophomore forward Paul Ingles and senior forward Brad Docksteader each found the back of the net with Brad Docksteader’s goal sealing the win in extra minutes. But it was junior goalie Cary Byron’s 41-save night that gave the Flames the upset. For fourth-seeded Liberty, the victory was as much mental as physical. Assistant Coach Mike Morrison cited his team’s underdog resilience as a major factor in both their game-one win and morale moving forward. Not 24 hours later, the Flames rallied from a two-goal deficit to take out the second-seeded Northern Arizona University Lumberjacks 6-2 in a late scoring frenzy Saturday. Lowes referenced Liberty’s bench contribution as the key to its second win. In postseason pool play when daily games mean extra wear and tear, the Flames depth gave them an advantage. Their half dozen goals were spread amongst five skaters. Sophomore forward Josh King found the back of the net once, and senior forward Brad Docksteader notched goals twice in the second period while sophomore defenseman Parker McIntyre, freshman forward Devon Docksteader and junior defenseman Clinton Nigh each scored in the third. Despite their strength in numbers and morale, the Flames Achilles’ heel proved to be penalty minutes. Liberty fell to the University of New Hampshire Wildcats 6-2 Sunday after amassing 31 penalty minutes. 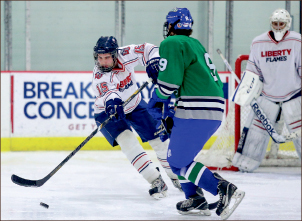 Freshman forward Ben Freymond and sophomore forward Josh King netted goals in the second period to avoid the shutout, but the Wildcats capitalized on power plays while the Flames special teams came up short. With both teams tied at 2-1 in tournament play, the victory sent New Hampshire to semifinals and the Flames back home, but with their heads held high. Coaches and players alike expressed their pride in the team’s exceptional regular and postseason success. They paid special homage to graduating seniors Bobby Cervone, Brad Docksteader and Greg White.